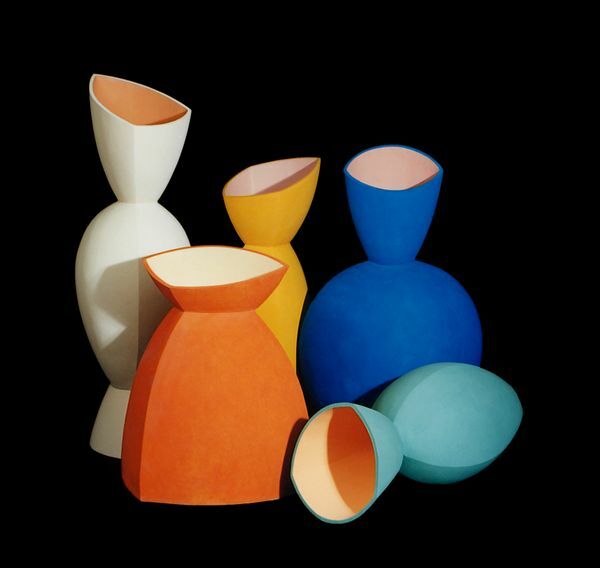 Elisabeth von Krogh works with ceramic media in strong colours and striking forms. Her main theme could be said to be the vessel as an art-historical subject. The vessel with its long and rich culture follows the history of man, as an object, it is immediately recognised and known to everyone. It is part of our collective experience and memory. Rather than focusing on the functional aspect of the vessel, von Krogh is more interested in blowing them up in size and playing with their form. Elisabeth Von Krogh is represented in all Norwegian museums collecting contemporary crafts as well as numerous private collections. She has been awarded several large public commissions, among others at Oslo Airport, and she has exhibited extensively both in Norway and the Scandinavian countries.